Taste test: These are very good plain ripple chips. The first thing I noticed when I opened the bag was the enormous chip at the top. It might’ve been the largest potato chip I’ve ever seen (and I’ve seen a lot of chips). That chip alone was like half a meal. 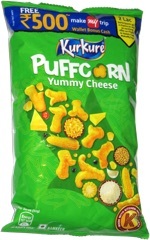 These chips have plenty of potato taste and are extremely crunchy. 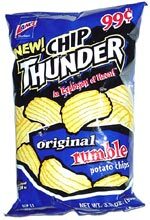 Chip Thunder, indeed! This snack was discovered by Jeremy at PhilaDeli, South Street, Philadelphia.